Choosing the right pair of shoes can make or break your game. Without the proper support, stability and sole, you can end up sliding all over the court or hurting your feet, legs, and knees. No matter what level of pickleball player you are, you need a pair of shoes you can rely on. We found some of the best pickleball shoes, so you can find a pair you know you can trust. With a high-quality build both inside and out, these New Balance MC806 Tennis Shoes have a non-marking sole and New Balance’s exclusive ABZORB cushioning. 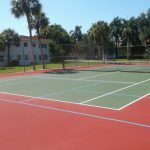 The shoes are designed for har surfaces, so you know that your feet and legs will be protected while you are playing pickleball. One of the reasons this New Balance shoe is a top-rated shoe for pickleball is because of the Rollbar technology. Rollbar keeps your heel in place during all types of movement which significantly lowers the risk of twister ankles. Because pickleball is played on courts that resemble volleyball courts, volleyball shoes are a great option. The ASICS GEL-Flashpoint Volleyball Shoes have a stabilizing Truss tic system which helps to keep you always stable in your shoes. Additionally, the gum rubber on the outsole of the shoe helps you have more traction while you are moving around the court. The best pickleball shoes also have a special forefoot gel cushion that reduces foot fatigue as you play. 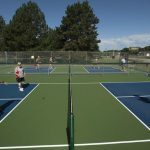 Like volleyball shoes, shoes designed for tennis are also a great option for best pickleball shoes. One of the other top rated pickleball shoes is the Adidas Barricade Club Tennis Shoe. The defining feature of these shoes is the soles that are designed to be used on cement courts. While incredibly durable, the soles are non-marking and perfect for pickleball courts. Players also love the cushioning soles with the ADIPRENE heel that lessens the shock of landings. Super breathable and lightweight, the Price T22 are a top-rated option for pickleball players and they have a cult following to prove it. Not only are the flexible, they also have great shock absorption and stabilization that allows for quick and efficient lateral movements. The shoes are equipped with specialized shock absorbers in the heel, forefoot and midfoot to allow for maximum shock absorption. They fill like a running shoe but have all the stability and shock absorption needed in a tennis shoes. The K-Swiss Hypercourt Express are flexible and lightweight. They mold to your feet but have great ventilation. The mid-sole is fitted with a Guideglide EVA midsole that not only helps with shock absorption, but also offers arch support right where you need it. Heel strikes happen frequently while playing pickleball. Without a good support system, this can quickly take a toll on your feet. The Saucony Grid Stratos 5 shoes have the GRID system in place in the heel specifically to lessen the impact of heel strikes. The upper part of the shoe is made of breathable mesh and have a lace up closure so you can ensure the perfect fit. 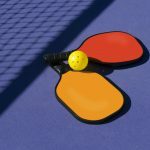 If you are looking for a great pair of pickleball shoes, these top rated options are the perfect place to start. From arch supports and heel cushions, these shoes will help you play at the top of your game for every game. The owner of this website, PickleballPOP, is a participant in the Amazon Services LLC Associates Program, an affiliate advertising program designed to provide a means for sites to earn advertising fees by advertising and linking PickleballPOP Review to Amazon properties including, but not limited to, amazon.com, endless.com, myhabit.com, smallparts.com, or amazonwireless.com. © 2019 Copyright PickleballPOP. All Rights Reserved.